Jill Of All Trades: Personalization of my passion for social media thanks to my smartphone! Personalization of my passion for social media thanks to my smartphone! I am a social media and internet addict. The first thing I do when I wake up is check my phone for notifications. Twitter, Facebook, Instagram, Whatsapp, Messenger, Hangouts and of-course good ol' emails. After all, what happens on social media, stays on the internet forever! And I love to shop online too, lazy that I am it works wonders. I also love to enter contests and competitions. It's been a thrill and passion since childhood days when I would play contests on Cartoon Network or Tinkle magazine. Today, I play contests on twitter, Facebook etc and have won quite a few of them too! Though of-course, I can view updates, notifications, contest alerts on desktop or laptop, it's not always there with me. When I'm traveling, when I'm too exhausted to switch on my PC or when I'm multitasking; my phone's to my rescue! I own an Android smartphone with the latest OS update and configuration. I try to make the most of my passion for social media by personalizing it on my phone. I have Twitter, Facebook, Instagram, Whatsapp, Snapchat, Pinterest all installed on my phone and have turned on notifications for my fav pages / brands or people. So the minute someone updates or tweets I get an alert. That was missing on the desktop sites as I would get notifications only if I'm logged in. On phone, I'm ALWAYS logged in! Not to boast, but I have won contests as small as brand merchandise or t-shirts, to shopping vouchers and even nailed a couple of big ones like smartphones and a laptop! But that would definitely not be possible if I did not have the access to the contests straight from my phone. When I'm traveling in the Mumbai locals, commuting 3+ hours a day in all, entering contests is my favorite pass time! Oh the thrill of knowing you're a winner! 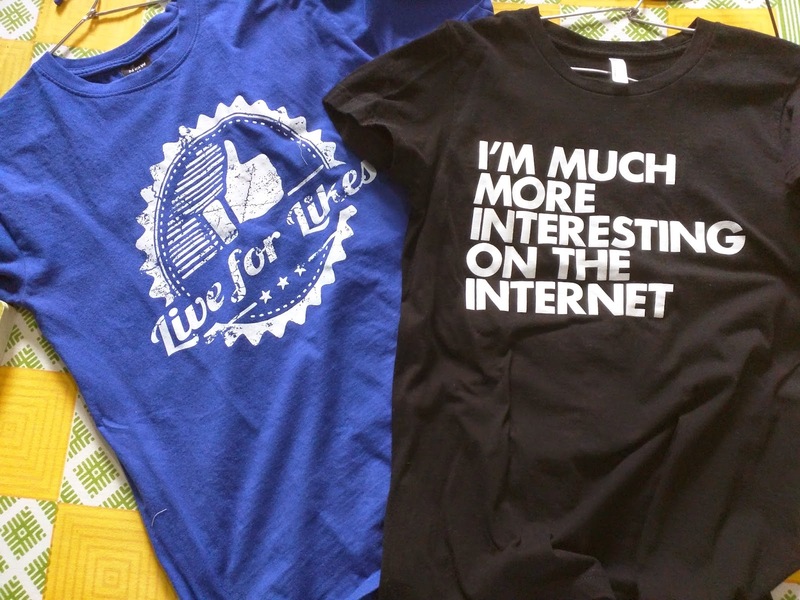 (This picture of a couple of T-shirts I own describe my all my passions – love for clothes and shopping, love for internet and love for contests since I won one of them on Myntra). I'm also all in for online shopping. Getting saved from my mad crown, heat and pollution in traveling, the awkward moment when the salesperson asks what size and things like that. Plus I get great deals and discounts! Flipkart & Myntra are my two personal favorite shopping destinations. Even better is their app versions! So I can literally shop ANYTIME ANYWHERE! Lazing on my bed or while in a boring meeting, I can be putting things in my wishlist and buying them anywhere anytime! Basically, online shopping gives me a reason to live for another 3-5 business days. I also get to blog on the go on my smartphone. So basically, my phone is my source of entertainment and work both! I hardly get on my laptop or desktop apart from office thanks to my personalized mobile experience. Say yes to healthy living! ASUS Zenfone 2 - Beauty AND a Beast! Raise the volume: Cool Car audio systems! L'Oreal Skin Perfect - Customized for your age!